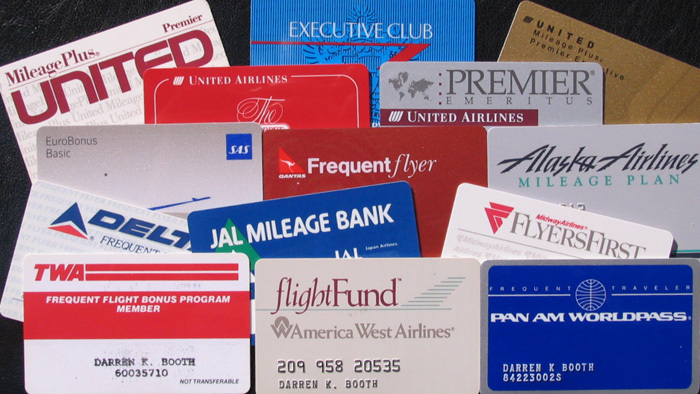 A FREQUENT-FLYER PROGRAM (FFP) is a loyalty program offered by many airlines. Typically, airline customers enrolled in the program accumulate frequent-flyer miles (kilometers, points, segments) corresponding to the distance flown on that airline or its partners. There are other ways to accumulate miles: In recent years, more miles were awarded for using co-branded credit and debit cards than for air travel. Acquired miles can be redeemed for air travel, other goods or services, or for increased benefits, such as travel class upgrades, airport lounge access, or priority bookings. In marketing generally and in retailing more specifically, a loyalty card, rewards card, points card, advantage card, or club card is a plastic or paper card, visually similar to a credit card, debit card, or digital card that identifies the card holder as a member in a loyalty program. Loyalty cards are a system of the loyalty business model. In the United Kingdom it is typically called a loyalty card, in Canada a rewards card or a points card, and in the United States either a discount card, a club card or a rewards card. Cards typically have a barcode or magstripe that can be easily scanned, some are chip cards or proximity cards. 3 Airfare Hacks for the Committed Penny-Pincher - The New York Times. Airline Miles Credit Cards - "Fly further on your favorite airline with these mileage earning credit cards. You can redeem miles for flights, upgrades, and more. Perks we like: free checked bag, lounge access, in-flight discounts, priority boarding." Best Airline Rewards Programs - The Huffington Post. How to Get a Good Deal on Flight Upgrades - The New York Times. Johnny Jet's credit card reward guides & resources - "Simplify Your Travel." Points - "Points Loyalty Wallet." Manage all your loyalty programs in one spot, move points and miles between programs, and redeem them for shopping and dining gift cards. Travel Rewards Credit Cards - "Travel often? Us, too... Don't miss out on extra points, upgrades, or airport lounge visits and start using a travel rewards card for all of your travel-related purchases. Perks we like: exclusive hotel collections, airport lounge access, Global Entry/PreCheck fee reimbursement, lost luggage insurance, no foreign transaction fees." Priority Pass - since 1992. "The world’s largest independent airport lounge access program." Membership offers great value for money and allows you to use any of 1000+ airport lounges whenever you travel. Southwest Rapid Rewards - "A reward flight is just one of the many rewards waiting for you when you're a Rapid Rewards® Member. We've made it easier than ever to earn points when you fly, participate with our Partners, and with the Rapid Rewards Points Center, get the points you need to enjoy those rewards even faster."